Albert Paley is a metalsmith and sculptor based in Rochester, NY whose early work in jewelry and furniture evolved into his current body of work of large scale, site-specific installations. Active as an artist for over 40 years, his work can be found in major cities, universities, and art museums around the world. Like many young smiths, when Kyle was first introduced to Paley's work as an apprentice, he was immediately drawn to his fluid, organic style. In stark contrast to the stiff, formal work of more traditional blacksmiths, Paley pushed the known limits of steel and the imaginations of a generation of smiths. 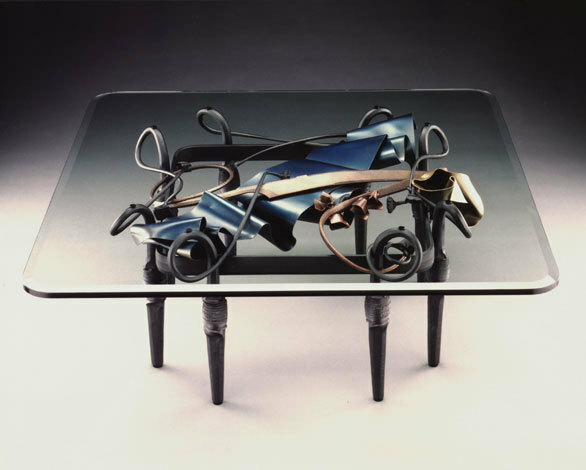 Today The Art of Albert Paley by Edward Lucie Smith, a coffee table book full of glossy images of his work, is a staple of the blacksmith library.